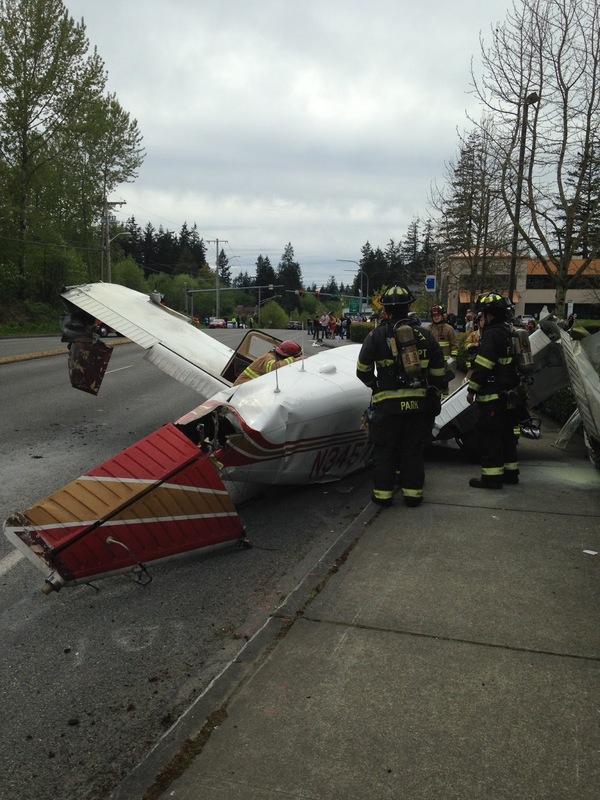 On May 2, 2017, at 1528 Pacific daylight time, a Piper PA-32-260 airplane, N3457W, struck power transmission cables and traffic lights and collided with the ground in Mukilteo, Washington, after a partial loss of engine power during the initial climb from Snohomish County Airport (Paine Field), Everett, Washington. 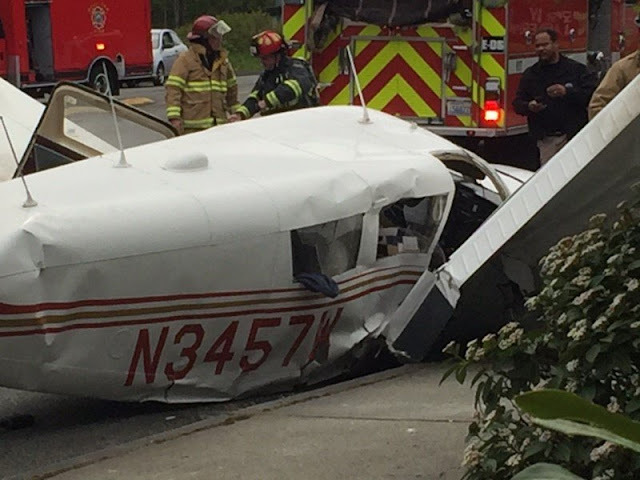 The private pilot was not injured, the passenger received minor injuries. The airplane sustained substantial damage. The airplane was registered to Klamath Aviation LLC., and operated by the pilot as a personal cross-country flight under the provisions of Title 14 Code of Federal Regulations Part 91. Visual meteorological conditions prevailed, and no flight plan had been filed. The flight was originating at the time and destined for Crater Lake-Klamath Regional Airport, Klamath Falls, Oregon. The pilot stated that he had just serviced the airplane with aviation gasoline prior to takeoff and filled the main tanks to the "tabs", and both tip tanks to capacity. He performed a preflight airplane walk around and checked the fuel for contamination at the sump drains. No anomalies were noted, and he boarded the airplane, sitting in the left seat. Due to a Boeing 787 airplane performing tests at the arrival end of runway 16R, the pilot accepted an intersection departure from runway 16R, at taxiway A4 (with about 5,600 ft of runway remaining). He taxied to the runup area adjacent to the intersection, and performed pre-takeoff checks, and an engine runup. He stated that all systems were normal, including both the magneto and carburetor heat checks, and after turning on the auxiliary fuel pump and confirming the fuel selector valve was set to the right tip tank, he taxied onto the runway and began the departure roll. Surveillance video from the air traffic control tower revealed that the airplane was in the runup area for about 3 minutes and began the takeoff roll about 30 seconds later. The pilot stated that the airplane accelerated appropriately, and he initiated a rotation at 80 mph. The airplane lifted off and continued to accelerate to 90 mph during the initial climb. The air traffic controller requested that the pilot perform a right turn when able, due to departing traffic behind, and as soon as the pilot began to initiate the turn, the engine lost power. The pilot estimated that the power loss occurred at an altitude of about 400 ft agl, and the airplane was not able to maintain altitude. He declared an emergency and checked both the fuel selector valve and fuel mixture positions and confirmed the engine primer was in and locked. With limited time to troubleshoot, he turned his attention to performing a forced landing. During the descent he noticed the engine appeared to be producing partial power, and the propeller continued to turn at 400 to 500 rpm. He observed an area of swamps and tall trees directly ahead, and to his right a busy six-lane road, running north-south. He could see to the right an east-west oriented road, which was free of traffic in the westbound lane. He maneuvered the airplane for landing in this lane, and as he approached, the right wing stuck a power transmission cable. Both wingtips then struck separate traffic lights, rupturing the tip tanks, and spraying ignited fuel over cars waiting at the intersection below. The airplane then collided with the ground and came to rest on the street. A witness, who was positioned in his automobile at an intersection adjoining the runway, reported that his attention was drawn to the airplane during takeoff, because it was emitting bursts of visible "exhaust". He stated that he was familiar with aircraft traffic and was drawn to look at the airplane because the exhaust trail was not a normal occurrence. The airplane was manufactured in 1966 and purchased by the pilot and passenger (who were the sole members of Klamath Aviation LLC.) on November 15, 2016. The most recent maintenance event was for an annual inspection, which was completed on September 21, 2016, at a total airframe time of 5,766.32 flight hours. At the time of inspection, the engine had accrued 567.42 flight hours since overhaul in September 1997. A special aviation routine weather report for Paine Field was issued at 1549. It included wind from 210° at 3 knots, with a temperature of 15° C, and a dew point of 9° C.
The carburetor icing probability chart from the FAA Special Airworthiness Information Bulletin CE-09-35 "Carburetor Icing Prevention", indicates a probability of serious icing at cruise power for the reported temperature and dew point. Runway 16R is 9,010 ft long and 150 ft wide, composed of grooved asphalt and concrete, and is at an elevation of 608 ft mean sea level. 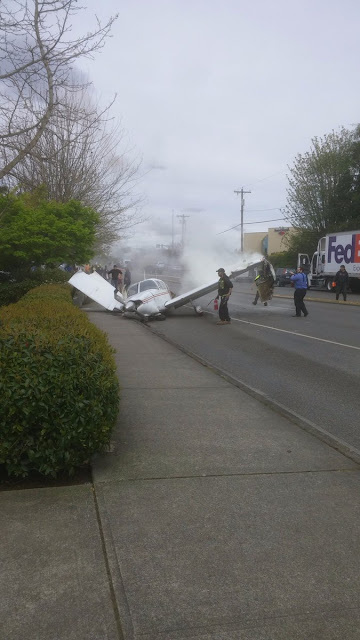 The airplane came to rest on a west heading on the street about 2,200 ft beyond the end of runway 16R, and 10° right of the runway centerline. The main cabin and left wing were largely intact. The horizontal stabilizer had detached, leaving the vertical stabilizer partially attached to the tailcone. The right wing had folded up about 45° at the root, and its main fuel tank had been breached. An FAA inspector who responded to the accident site stated that shortly after his arrival he checked the left main fuel tank, which was the only unbreeched tank, and found that it contained fuel. He then removed the carburetor bowl drain plug, and fuel drained from the bowl. The airplane was recovered from the accident site and examined by the NTSB investigator-in-charge, inspectors from the FAA, and technical representatives from Lycoming Engines and Piper Aircraft. Complete examination reports are contained within the public docket, the following is a summary of the findings. All fuel lines and fittings were intact from the fuel tanks through to the carburetor, and there were no indications of a fuel leak. The fuel selector bowl contained about 1/4 cup of clean, bright, light-blue colored fuel. The fuel selector valve moved freely through its range, and the detents were positive. The fuel from the bowl was tested with water detecting paste, and no water was found. The engine sustained minimal damage and remained partially attached to the firewall, with the upper left engine mount broken. The propeller was still attached to the crankshaft, and both blades exhibited about 360° of tip curl, with chordwise scratches present on the curled sections. One blade tip had detached, leaving a jagged separation surface. The dipstick indicated the engine contained 6 quarts of oil. The top and bottom spark plugs were all Champion REM 38E types, which were appropriate for the engine application. The plugs exhibited normal wear signatures consistent with short service life when compared to the Champion AV-27 check-a-plug chart. The electrodes of the top plugs for cylinders 1 through 4 were dark grey in color. All remaining plug electrodes were coated in dark grey/black soot corresponding to "carbon fouled" as denoted on the Champion chart. The engine was readied for a test-run by removal of the airbox (which was crushed on impact) and replacement of the propeller. Fuel recovered from the airplanes left wing main tank was used for the test and fed from a cannister connected to the right tip tank fuel line at the wing root. (Both wings were removed during aircraft recovery). After two cranking attempts, the engine started, and was operated for about 4 minutes at speeds varying from 700 to 2,500 rpm. The engine operated smoothly throughout; each magneto indicated a 100 rpm drop when tested at 1,500 rpm, and the engine speed responded to adjustments of the propeller and throttle controls. Following the run, the top spark plugs were removed. The black soot was gone, replaced with dark grey coloration. The carburetor and both magnetos were removed and examined at an overhaul facility. Both magnetos were tested in a magneto test stand and produced sparks in firing order throughout their operating speed range. Maintenance records indicated that the carburetor was installed in 1997, coincident to the engine overhaul. No other carburetor-related maintenance entry was found beyond the replacement of the sump plug in 2006, and the repair and removal of the carburetor inlet air box. The carburetor appeared undamaged, and all fittings were intact. The fuel inlet screen was clear, and the throttle and mixture control arms could be moved freely. All carburetor bowl screws were secure and tight, and remained affixed with a lock-tab washer. There was no evidence of fuel leak or discoloration at the interface between the body and bowl. The carburetor bowl was separated to facilitate internal examination, revealing a brass float. The float assembly was intact, and the clearance from the throttle body to bowl gasket and float was measured and fell within the tolerance described in the service manual. The float-to-bowl clearance was then measured in accordance with the service manual and found to be out of tolerance. Rub marks were present in multiple locations on the inner surface of the bowl walls, indicative of float contact. Removal of the float revealed that it was slightly twisted, with one side resting 1/16th inch above the other at its tip. The float was then tested for leaks, and none were found. Service Bulletin SB-4 Rev. B, published by Volare Carburetors, LLC, on September 2, 2009, documented reports of stuck, leaking, and/or worn floats when the float-to-bowl clearance value was not correct. The bulletin encompassed MA series carburetors manufactured by Volare, Precision Airmotive, and Marvel-Schebler, and recommended either measuring the clearance immediately should symptoms exist, or within 100 flight hours or 90 days (which ever came first). The bulletin required the replacement of the floats if the tolerance was not met, then stamping of "FC" on the mounting flange adjacent to the throttle shaft. No logbook entry was found indicating this bulletin had been complied with, nor was there any evidence of "FC" being stamped on the flange. White thread sealant compound was found on multiple fittings and bolt threads throughout the carburetor, including the inlet filter screen. Service Bulletin: SB-10 Rev B, published August 12, 2010, by Marvel-Schebler, describes the unauthorized use of such sealant. The service bulletin states that thread sealant should not be used on any carburetor component, as it has been found to break away and clog internal fuel passages. The service bulletin calls for immediate overhaul if any traces of sealant are observed. Service Bulletin MSA-3, revision 1, published by Precision Airmotive on November 18, 1991 describes the overhaul periods for MA series float-type carburetors. The bulletin recommended replacement of all carburetors within 10 years of their placement into service. A fuel receipt provided by a fixed based operator at Paine Field revealed that the airplane was serviced with the addition of 41.2 gallons of 100 octane low-lead aviation gasoline about 30 minutes before the accident. The manager of the facility stated that two other aircraft purchased fuel immediately after the accident airplane, and neither reported issues. He also checked the fuel storage and delivery system for water contamination and found none. This is preliminary information, subject to change, and may contain errors. Any errors in this report will be corrected when the final report has been completed. NTSB investigators may have traveled in support of this investigation and used data provided by various sources to prepare this aircraft accident report. 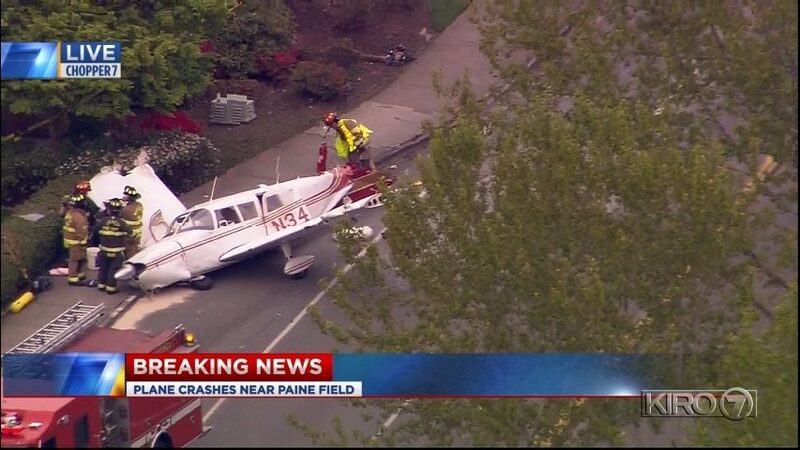 On May 2, 2017, at 1529 Pacific daylight time, a Piper PA-32-260 airplane, N3457W, struck powerlines and traffic lights, and collided with the ground in Mukilteo, Washington, after a loss of engine power during takeoff from Snohomish County Airport (Paine Field). The airplane was registered to Klamath Aviation LLC., and operated by the private pilot as a personal flight under the provisions of 14 Code of Federal Regulations Part 91. The pilot was not injured, the passenger received minor injuries, and the airplane sustained substantial damage. The cross-country flight departed Paine Field about 1527, with a planned destination of Crater Lake-Klamath Regional Airport, Klamath Falls, Oregon. Visual meteorological conditions prevailed and no flight plan had been filed. The pilot had just serviced the airplane with 41.2 gallons of fuel, and reported that he filled the main tanks to the "tabs", and both tip tanks to capacity. He performed a preflight airplane walkaround, and checked the fuel for contamination at the sump drains. No anomalies were noted, and he boarded the airplane, sitting in the left seat. Due to a Boeing 787 airplane performing tests at the arrival end of runway 16R, the pilot accepted an intersection departure from runway 16R, at taxiway A4 (with about 6,400 ft of runway remaining). He taxied to the runup area adjacent to the intersection, and performed pre-takeoff checks, and an engine runup. He stated that all systems were normal, and after turning on the auxiliary fuel pump, and confirming the fuel selector valve was set to the right tip tank, he taxied onto the runway and began the departure roll. The pilot stated that the airplane accelerated appropriately, and he initiated a rotation at a speed of 80 mph. The airplane rotated, and continued to accelerate to 90 mph during the initial climb. The air traffic controller requested that the pilot perform a right turn when able, due to departing traffic behind, and the pilot reported that as soon he began the turn the airplane lost power. The pilot estimated that the power loss occurred at an altitude of about 400 ft agl, and the airplane was not able to maintain altitude. He declared an emergency, and checked both the fuel selector valve and fuel mixture position, and confirmed the engine primer was in and locked. With limited time to troubleshoot, he began to turn his attention to performing a forced landing. He could see an area of swamps and tall trees directly ahead, and to his right a busy six-lane road, running north-south. He could see to the right an east-west oriented road, which was free of traffic in the westbound lane. He maneuvered the airplane for landing in this lane, and has he approached, the right wing stuck a power transmission cable. Both wingtips then struck separate traffic light signals, rupturing the tip tanks, and spraying ignited fuel over cars waiting at the intersection below. 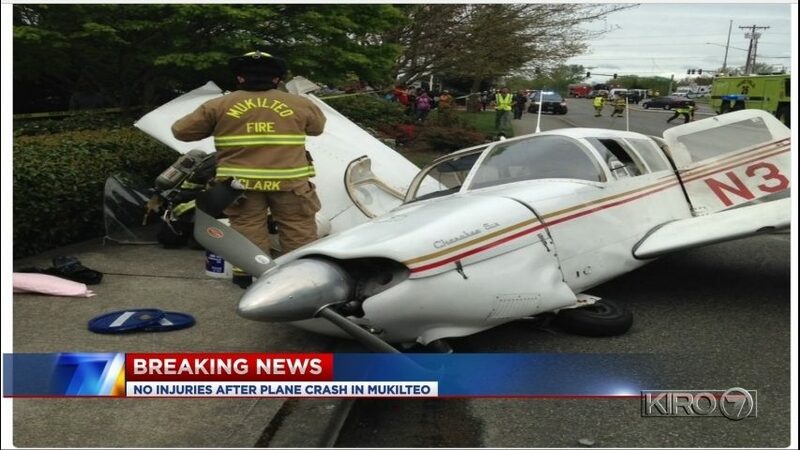 The airplane then collided with the ground, and came to rest on the pavement. A witness, who was positioned in his automobile at an intersection adjoining the runway, reported that his attention was drawn to the airplane before the collision, because it was emitting intermittent puffs of visible "exhaust".